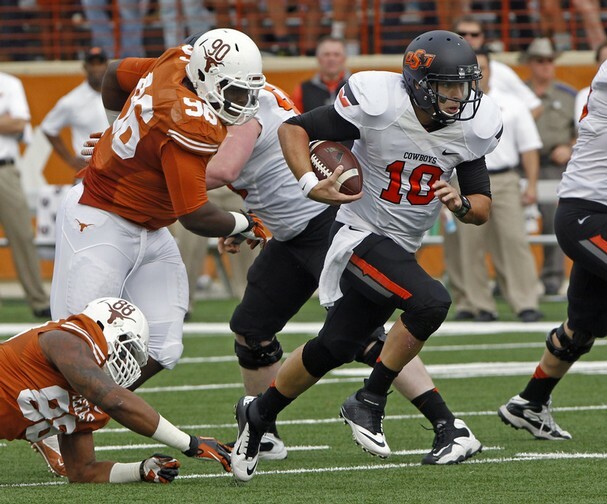 Oklahoma State QB Clint Chelf rushed for 95 yards, passed for 197 yards and and accounted for 4 TD’s against Texas. When the Oklahoma State Cowboys traveled to Austin, Texas to face the Texas Longhorns, it was a battle to stay in contention to win the Big 12 Championship. The Cowboys were 5-1 in the conference, but a win against the Longhorns would put them in a showdown with the Baylor Bears for the lead in the Big 12. Oklahoma State was on a 5 game win streak and was 4-0 since senior quarterback Clint Chelf took over as the starter. The Cowboys were once known for their passing attack, but during the win streak, it has been their running game and defense that has been their strength. Chelf has a reputation as a pocket passer, but he has done a very good job running the ball and giving his team a spark. The Longhorns started off the season losing the 2 of the first 3 games and the rumors began that Coach Mack Brown would be fired. Since that time, the Longhorns had won 6 straight games with senior quarterback Case McCoy leading the way. Texas as a bit dinged up coming into the game with leading rusher Jonathan Gray and senior defensive tackle Chris Whaley both out for the year with injuries. Neither team did much with their first possession, however, on Oklahoma State’s second possession, Chelf began to put pressure on the defense with his legs. The Cowboys drove 72 yards in 7 plays and Chelf had runs of 14, 22 and then an 18 yard touchdown run to put the Cowboys up 7-0. The Longhorns responded by mixing the passing of McCoy and the running of junior Malcolm Brown to drive into Cowboy territory, but had to settle for a 39 yard field goal to cut the Oklahoma State lead to 7-3 going into the 2nd quarter. Early in the 2nd quarter, the Cowboys pinned the Longhorns deep when they downed a punt at the 4 yard line. When the Cowboys forced the Longhorns to punt, they got the ball back at the Longhorn 42 yard line. Chelf was able to capitalize on the good field position and completed passes of 8 yards to running back Jeremy Smith, 11 yards to receiver Tracy Moore and 15 yards to receiver Charlie Moore to move his team to the Texas 4 yard line. From there, Chelf ran the ball in and put his team up 14-3. When the Longhorns got the ball back, McCoy mixed the running of Joe Bergeron and passes to Mike Davis to move his team downfield. Malcolm Brown scored from 7 yards out to cut the Cowboys lead to 14-10 with 3:39 left in the half. Chelf drove his team into the red zone once again, but this time it looked like the Texas defense had them stopped. On 2nd and 8 from the Texas 12 yard line, Chelf’s pass went right through the hands of senior safety Adrian Phillips and Tracy Moore caught the pass for the touchdown. The entire stadium was shocked as it looked like Philips had the turnover. The Longhorns had one last chance in the half trailing 21-13 with 1:15 left. McCoy was able to get his team one first down, but then on 1st and 15 from his own 37, McCoy’s pass was picked off by senior corner Justin Gilbert and he returned it 43 yards for a touchdown. In less than 1:00 of clock time, the game went from a manageable game to out of control and the Cowboys took a 28-10 lead into halftime. The Longhorns received the 2nd half kickoff and were able to move 84 yards in 10 plays, but had to settle for a field goal to cut the lead to 28-13. The Cowboys, however, responded with a drive of their own, moving 53 yards in 10 plays and then kicked a 39 yard field goal to increase their lead again to 18 points. With time not on their side, it became apparent that McCoy began to press. With only 0:42 left in the 3rd quarter, McCoy heaved a long pass down the right sideline that was picked off by Justin Gilbert. It was Gilbert’s 2nd pick of the game. The quarter ended with Oklahoma State on top 38-13. Neither team did much with the ball on their first possession of the 4th quarter. With 9:04 left, Texas went on a 10 play drive that moved them to the Cowboy’s 40 yard line, however, on 4th down, McCoy’s pass to Mike Davis was incomplete and the Cowboys took over on downs. Texas only got the ball back one more time and by then the game was out of reach. Mack Brown pulled McCoy and gave freshman quarterback Tyrone Swoopes some playing time as the Cowboys held on to win 38-13. The Oklahoma State win sets up a showdown at home against Baylor this week with the winner having the upper hand at winning the Big 12 title. The Cowboys were able to control the clock and run the ball all day long against the Longhorns defense. The game against Baylor should be very interesting. Baylor has not won in Stillwater, Oklahoma since 1939. The Longhorns were obviously missing the leadership of Gray and Whaley. Gray is their best player on offense and gives them a home run hitter that can take it the distance on any carry. Whaley was a big part of their run defense. Without Whaley, Chelf ran roughshod through the Longhorn defense and many of his runs were right up the middle. Texas falls to third in the conference with a 6-1 conference record. They could still win the conference, but they will need some help. They would need Baylor to beat Oklahoma State this week and then the Longhorns would have to win out, including a win over Baylor. It doesn’t look good, but this team has responded to adversity all year, so don’t count them out just yet. Clint Chelf, QB, Sr: Has his team on a winning streak since taking over a starter. Known as a pocket passer, but has improved as a runner. Used his legs to make an impact. Gritty. Makes positive plays. Sometimes stares down his receiver allowing the defender to make a play on the ball. Makes quick decisions. Spreads the ball. Completed 16 of 22 for 197 yards, 2 TD and 1 INT. Ran the ball 10 times for 95 yards and 2 TD. Desmond Roland, RB, Jr: Very good in the red zone. Has 8 TD in last 4 games. Very good moves in traffic. Able to start inside, then bounce outside. Tough. Injured shoulder, but returned to play. 19 carries for 59 yards. 2 catches for 25 yards. Jeremy Smith, RB, Sr: Good burst through the hole. Good feet in space. 5 carries for 10 yards. 1 catch for 8 yards. Charlie Moore, WR, Sr: Tough. Goes over the middle. Runs good routes. Gets good yardage after the catch. Doesn’t give up on a play. 6 catches for 83 yards and 1 TD. Tracy Moore, WR, Sr: Great concentration. Great TD catch off of a tip. Had 2 catches for 23 yards and 1 TD. Tyler Johnson, DE, Sr: Quick first step. Can be disruptive in the backfield. 5 tackles, 1 tackle for loss and 1 forced fumble. Caleb Lavey, MLB, Sr: Always around the ball. Makes an impact in all areas of the defense. Three down linebacker. Knows how to get into the passing lanes. 8 tackles and 1 interception. Justin Gilbert, CB, Sr: Had a very good game. Tough. Plays tight man coverage. Plays with very good inside position. Uses great technique. Able to sit on routes and react. Good kick returner. Had 9 tackles, 1 pass breakup and 2 interceptions, one of which he returned 43 yards for a touchdown. Had a 41 yard kick return. Tyler Patmon, CB, Sr: Transfer from Kansas. Has great instincts. Breaks hard on the ball. Had 8 tackles. Daytawion Lowe, S, Sr: Big hitter. Plays off of blocks. Can sometimes be too aggressive and hurt his team. Had 7 tackles. Was called for an illegal roughness penalty and a facemask penalty. Case McCoy, QB, Sr: Son of a football coach with high football IQ. At times he can be a gunslinger. Doesn’t have the greatest physical tools, but can beat you with his knowledge of the game. Seemed to be trying to do too much and made some poor decisions that he doesn’t normally make. Completed 26 of 39 for 221 yards and had 3 interceptions. Malcolm Brown, RB, Jr: Good combination of speed and size. Stepping up after the injury to Jonathan Gray. Has had more carries since the Oklahoma game and has responded well. Able to push the pile. Gets yardage after contact. Has 4 straight games with at least 1 TD. Runs through tackles. Converted a 4th and 1. Had 25 carries for 73 yards and 1 TD. 2 catches for 16 yards. Joe Bergeron, RB, Jr: Good size (6-1, 230). High school fullback. Very physical, punishing runner. Good stiff arm. Good feet. Runs with good forward lean. Great balance. Good outlet receiver. Had 10 carries for 49 yards. 5 catches for 42 yards. Mike Davis, WR, Sr: Big play receiver. Has good speed and quickness. Tough. Took a big hit then responded on the next play with a 41 yard catch. Great footwork on the sideline. Had 9 catches for 112 yards. Had a false start penalty. Jaxson Shipley, WR, Jr: McCoy’s go to receiver. Great in space. Very dependable on 3rd down. Had 6 receptions for 43 yards. Trey Hopkins, G, Sr: Very experienced. Has 47 starts in his career. Has played guard and right tackle. Mason Walters, G, Sr: Fifth year senior, 4 year starter. Key to the inside running game. Good movement skills. Able to get outside on screen plays. Jackson Jeffcoat, DE, Sr: NFL bloodlines. Son of former Dallas Cowboys defensive end Jim Jeffcoat. Very physically gifted. Had 8 tackles, 1 tackle for loss and 1 batted ball. Had a roughing the passer penalty. Desmond Jackson, DT, Jr: Quick and disruptive. Sheds blockers quickly. Had 4 tackles, ½ tackle for loss. Steve Edmond, MLB, Jr: Good size (6-3, 245) Good run stuffer. Wraps up well. Had 8 tackles. Carrington Byndom, CB, Sr: Physical. Good blitzer off the edge. Had 5 tackles. Adrian Phillips, S, Sr: Breaks hard on the ball. Dropped an interception that went for a touchdown. Had 8 tackles, ½ tackle for loss. Mykkele Thompson, S, Jr: Good leaping ability. Able to catch the ball at its’ highest point. Had an interception in the red zone. Had 7 tackles. This entry was posted on November 21, 2013 by draftmaniacs in Scouting reports and tagged 2014 nf, Clint Chelf, NFL, NFL Draft, Oklahoma State Cowboys football, Texas Longhorn football.